Every year preparations get underway for the tour of homes well before Christmas time. The homes that are invited to be on the tour are some of the finest historic and unique houses in Jefferson Texas. And with a town with so many historic places it has to be a daunting job picking the perfect houses. This year is no exception with these houses originally built in the years of 1850’s to 1890’s. All are excellent examples of the architecture of the time and very beautifully kept or in some cases restored. The homes on tour this year are the Terry-McKinnon House, Rowell-Harris House and the Oak Alley House. 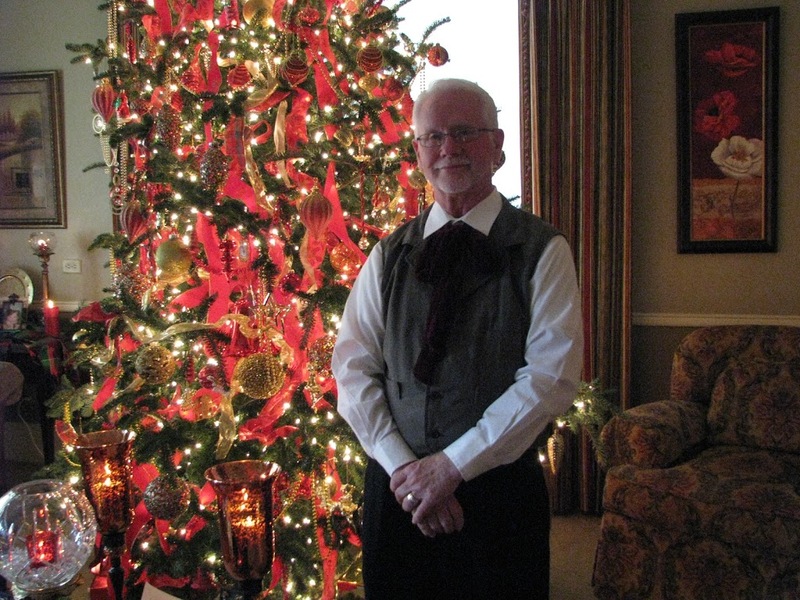 All the homes are decorated for the holiday season with fresh live greenery, candlelit luminaries along the walk ways and as a special treat the Jefferson Riverport Ambassadors help with the guided tours in their finest historic clothing. Each room of the home has a docent telling the history of the house and even some of the special items that may be in the home. There are many more festivities planned that I will write about at a later time. Now is the time to be thinking about booking your reservations for this very popular event in Jefferson. Mark your calendars and come to town for a long weekend. Heck you might even pick up a few items on your Christmas list while you’re here. Thurs. November 29, 2012 from 3 to 7 p.m. and Fri. & Sat. November 30 – December 1, 2012 from 5 to 9 p.m.
Thurs. December 6, 2012 from 3 to 7 p.m. and Fri. & Sat. December 7 & 8, 2012 from 5 to 9 p.m. While touring the homes on the weekends, be on the lookout for a few special features that might not be publicized previously. Last year we were able to listen to some beautiful caroling around town. If you’d like more information you can certainly visit the website of Historic Jefferson Foundation’s Candlelight Tour of Homes. Are you coming on a tour bus? Would you like a step-on guide to lead your group? Please call Mary Nash at 214-478-3152. 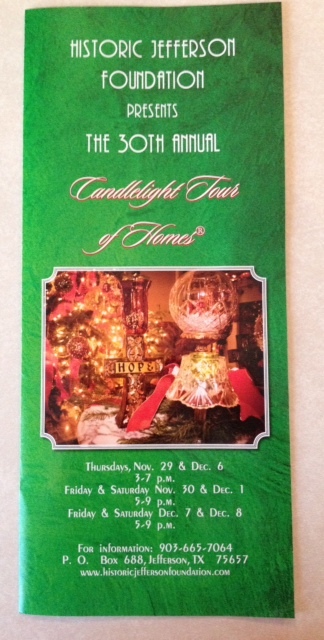 Reservations for a step-on guide must be made in advance of the Jefferson Texas Candlelight tour of Homes. 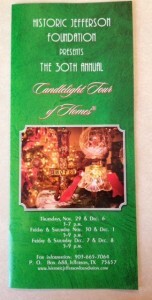 This entry was posted in Christmas, Holidays, Tour of Homes by Tammy D. Bookmark the permalink.